Home Posts tagged "Metallic foil"
in silver – French party guidance with pictures. We hope that you liked! in crystal – Party French nail art motif step by step. We hope that you liked! in gold – Full cover instruction. 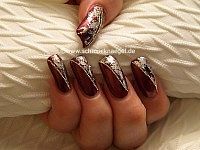 Fingernail motif in the colours black, silver and dark-pink – Full cover nail art instruction.